This document was originally released by George Knapp of KLAS TV in Las Vegas. The original is a photocopy of a document. No date or location of the source of the report is mentioned. This link has the original pdf. During the period of approximately 10-16 November 2004, the Nimitz Carrier Strike Group (CSG) was operating off the western coast of the United States in preparation for their deployment to the Arabian Sea. The USS Princeton on several occasions detected multiple Anomalous Aerial Vehicles (AAVs) operating in and around the vicinity of the CSG. The AAVs would descend “very rapidly” from approximately 60,000 feet down to approximately 50 feet in a matter of seconds. They would then hover or stay stationary on the radar for a short time and depart at high velocities and turn rates. On 14 November after again detecting the AAV, the USS Princeton took the opportunity of having a flight of two F/A-18Fs returning from a training mission to further investigate the AAV. The USS Princeton took over control of the F/A-18s from the E-2C Airborne Early Warning aircraft and vectored in the F/A-18s for intercept leading to visual contact approximately one mile away from the AAV, which was reported to be “an elongated egg or a “Tic Tac” shape with a discernable midline horizontal axis”. It was “solid white, smooth, with no edges. It was “uniformly colored with no nacelles, pylons, or wings.” It was approximately 46 feet in length. The F/A-18Fs radar could not obtain a ‘lock’ on the AAV; however it could be tracked while stationary and at slower speeds with the Forward Looking Infrared (FLIR). The AAV did take evasive actions upon intercept by the F/A-18, demonstrating an advanced acceleration (G), aerodynamic, and propulsion capability. The AAV did not take any offensive action against the CSG; however, given its ability to operate unchallenged in close vicinity to the CSG it demonstrated the potential to conduct undetected reconnaissance leaving the CSG with a limited ability to detect, track, and/or engage the AAV. The Anomalous Aerial Vehicle (AAV) was no known aircraft or air vehicle currently in the inventory of the United States or any foreign nation. The AAV exhibited advanced low observable characteristics at multiple radar bands rendering US radar based engagement capabilities ineffective. The AAV exhibited advanced aerodynamic performance with no visible control surfaces and no visible means to generate lift. The AAV exhibited advanced propulsion capability by demonstrating the ability to remain stationary with little to no variation in altitude transitioning to horizontal and/or vertical velocities far greater than any known aerial vehicle with little to no visible signature. The AAV possibly demonstrated a highly advanced capability to operate undersea completely undetectable by our most advanced sensors. 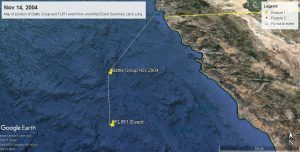 The following events took place during deployment preparation of the Nimitz Carrier Strike Group (CSG) during the months of November and December 2004 in the SOCAL Operating Area off the coast of California and Mexico. The CSG was comprised of the following ships and submarine: USS Nimitz (CVN-68), USS Princeton (CG-59), USS Chafee (DDG-90), USS Higgins (DDG-76), and the USS Louisville (SSN-724). The Nimitz was home to Carrier Air Wing 11 (CVW-11) comprised of VMFA-232 (USMC F/A-18C), VFA-14 (F/A-18E), VFA-41 (F/A-18F), VFA-94 (F/A-18C), VAQ-135 (EA-6B), VAW-117 (E-2C), HS-6 (H-60), and VRC-30 Det 3 (C-2A). The only participants in the events surrounding the detection and intercept of the AAV are the USS Princeton, VAW-117, VMFA-232, and VFA-41. USS Princeton (CG-59) is a Ticonderoga-class cruiser guided-missile cruiser serving in the United States Navy. Armed with naval guns and anti-air, anti-surface, and anti-submarine missiles, plus other weapons, she is equipped for surface-to-air, surface-to-surface, and anti-submarine warfare. She also is the home of two Seahawk LAMPS helicopters. The Princeton was the first Ticonderoga-class cruiser to carry the upgraded AN/SPY-1B radar system. The USS Princeton was part of the Nimitz Carrier Battle Group, during the period of approximately 10-16 November 2004 while completing Tailored Ships Training Availability (TSTA) in preparation for their deployment to the Arabian Sea, During COMPTUEX, which is intermediate level training for elements of the Nimitz Carrier Strike Group (CSG) prior to the deployment, the Princeton on several occasions detected multiple AAVs operating in and around the vicinity of the location shown in Figure 1. The Fire Control Officer_________, and his technician, FCCS______ initially thought the contacts were part of the COMPTUEX exercise. According to Senior Chief____.’ the AAVs would descend from a very high altitude into the scan volume of the AN/SPY-1 at a high velocity. The top of the scan volume would put the AAVs at higher than 60,000 feet. The AAVs would descend “very rapidly” from approximately 60,000 feet down to approximately 50 feet in a matter of seconds. They would then hover for a short time and depart at high velocities and at turn rates demonstrating an advanced acceleration (G) capability. Senior Chief____added that based on his experience, which is 17 years as a Fire Control on Aegis cruisers, the AAV exhibited Ballistic Missile Characteristics in reference to its appearance, velocity, and indications on the radar. Since the radar was in the mode to handle Air Intercept of conventional aircraft it never obtained an accurate track of the AAVs and was quickly “dropped” by the radar meaning it was eliminated by the computer to reduce the amount of clutter on the radar, as any other false target is handled. If the radar were set up in a mode for Ballistic Missile tracking they likely would have had the capability to track the AAV. They were detected three separate times during the week operating off the western coast of the United States and Mexico. The Tactical Air Officer onboard the Princeton could not identify the radar contact and given the high speed and altitude was perplexed. The Meteorological Officer (METOC) onboard the Princeton provided a briefing that discussed a high altitude weather phenomena where ice crystals can form and be detected by the AN/SPY-1. On 14 November 2004, after again detecting an AAV took the opportunity of two F/A-18s airborne in the vicinity to task them for airborne reconnaissance of the AAV. The Grumman E-2 Hawkeye is an American all-weather, aircraft carrier-based tactical Airborne Early Warning (AEW) aircraft. The twin turboprop aircraft was designed and developed in the 1950s by Grumman for the United States Navy as a replacement for the E-1 Tracer. The United States Navy aircraft has been progressively updated with the latest variant, the E-2D, first flying in 2007. The Hawkeye provides all-weather airborne early warning and command and control functions for the carrier battle group. Additional missions include surface surveillance coordination, strike and interceptor control, search and rescue guidance and communications relay. An integral component of the carrier air wing, the E-2C uses computerized sensors to provide early warning, threat analysis and control of counteraction against air and surface targets. It is a high-wing aircraft with stacked antennae elements contained in a 24-foot (7.3 m) rotating dome above the fuselage. The AN/APS-145 Airborne Surveillance Radar is the most reliable, cost-effective, high-power advanced early warning radar available. This sophisticated system is the latest in a long line of airborne early warning systems from Lockheed Martin, Over 100 E-2C’s have been completing nearly 100 percent of their missions, day in and day out, for more than two decades. The AN/APS-145 carries on the tradition, adding several significant features found in no other airborne surveillance radar. High-power UHF Doppler radar that utilizes a rotating antenna within a circular radome mounted atop the aircraft. On 14 November 2004, LT.__________ E-2C NFO, was in VAW-117 and airborne during the contact. Additionally, he was the squadron’s avionics division officer and would be responsible for any and all RADAR recordings, etc.,. Unfortunately in the E-2C, it is not routine to have any kind of recording engaged unless it is pre coordinated which is typically only used during airborne testing of new capabilities, etc… There was no recording of this event. LT.__________ was flying as the Air Control Officer (ACO) on the mission where the AAV was observed by the flight of F/A-18s. He was controlling the F/A-18s that were flying as part of their work ups prior to deployment. He did not see the object on his radar (raw video) until the USS Princeton directed the contact and gave the E-2 the general direction to steer its radar. LT.__________ initially thought the return was a wave because in a high sea state (4 or greater) the E-2C RADAR can actually detect the waves. Additionally, the target was so low and the return was so faint that without the inputs from the USS Princeton the return would have been missed/ignored. This was even more interesting because the USS Princeton initially reported the target to be at 15,000 – 20,000 feet MSL. Due to the intermittent radar return from the target, velocity was unavailable. Although initially requested by the USS Princeton to attempt a track of the object, the USS Princeton took control of the F/A-18s and the E-2C remained airborne but was no longer involved in the contact or control. The fighters were being controlled by the USS Princeton for the duration of the contact and intercept. The E-2 aircrew on board monitored the Air Defense Control (ADC) Net during the contact were puzzled while listening to all of the merge calls coming over the net (typical of what you would hear during the Airborne Intercept of an enemy fighter). It was obvious there was something out there and the fighters were taking it seriously. This section provides the debrief of the F/A-18 pilots and weapon system operators (WSOs) from VFA-41 that were able to get both a visual and sensor contact with the AAV on 14 November 2004 at approximately N31 20′ W117 10′ about 70nm south of the U.S./Mexico Border 30 nm off the Baja Mexico Coast (Figure 1). Additionally the statement provided by the Commanding Officer (CO) of VMFA-232. Lt. Co Kurth, Commanding Officer VMFA-232, was flying a single-seat F/A-18C that launched from the USS Nimitz at approximately 1030L to conduct a Functional Check Flight of an aircraft that had recently completed significant maintenance. He noted the weather that day was blue skies, no clouds, and unlimited visibility. After 30 minutes into his flight he received a radio call from his air controller asking him to investigate an unidentified airborne contact. This was not a standard request. Additionally the controller asked if he had ordnance onboard, which was odd since no controller had ever asked that question during a situation of identifying an unknown contact over U.S. or International territory. He responded that he had no ordnance onboard. The controller provided vectors to the vicinity of figure 1. The object was reported to be at “slow speed and low altitude”. While enroute, at approximately 250 knots indicated/400 knots groundspeed, at medium altitude (15-25,000 feet), he gained radar contact of what he believed to be two F/A-18s that were approaching the AAV from the west at low altitude (500-5,000 feet). There was no other traffic on the radar. The controller informed him to remain above 10,000 feet, as there was other fighter traffic at low altitude investigating the AAV. As he approached approximately 15nm from the AAV descending through approximately 15,000 feet, he could see a water disturbance in the ocean surface. He recalled that the sea state was low (calm). At approximately 5-10 nm away from the AAV, the controller told him to “skip it” and return to his operating area. Since he was close he elected to fly over the water disturbance to try and see what was causing it. The disturbance appeared to be 50 to 100 meters in diameter and close to round. It was the only area and type of whitewater activity that could be seen and reminded him of images of something rapidly submerging from the surface like a submarine or ship sinking. It also looked like a possible area of shoal water where the swell was breaking over a barely submerged reef or island. He overflew the disturbance and turned back to the northwest. As he was flying away he could see the disturbance clearing and could no longer identify the place where it occurred. He did not see any object or vessel associated with the disturbance either above the surface, on the surface, or below the surface. He also never made visual contact with the other fighter aircraft that were vectored to the location or the AAV. It is possible that the disturbance was being caused by an AAV but that the AAV was ‘cloaked’ or invisible to the human eye. Lt. Co Kurth recovered aboard the Nimitz at approximately 1200L. He reported to the Carrier Intelligence Center (CVIC) and was asked by his Intelligence Officer, lst Lt _____if he saw the “supersonic Tic Tac”? We questioned now Capt.______ to determine if he had any further information, but based on his position in CVIC at the time he was not involved in any further discussions concerning the AAV. CDR Fravor, Commanding Officer VFA-41, was the pilot of FastEagle 01. He and LT.__________ were in the lead aircraft of the first F/A-18F section airborne that day from VFA-41, call sign FastEagle 01. The flight walked, started and launched with no issue. They completed their departure from the USS Nimitz and flew to the working area to conduct the training portion of the flight. After they completed their training the E-2C controller handed them off to the USS Princeton callsign ‘Poison’ where they received vectors via Bearing Range Altitude Aspect (BRAA ) to an unknown contact flying into the working area from the south. Poison asked what ordnance they had on board. LT.__________ told Poison control that they had two captive training AIM-9Ms (CATM-9) and no other ordnance. CDR Fravor and LT.__________ were attempting acquire the object visually as they heard “merge plot” from Poison. Situational awareness to the object was initially received via sporadic Link-16 tracks (Link-16 is a time division multiple access data-link) via an off-board sensor. LT.__________ assumed that the sensor providing the information was the USS Princeton’s SPY-1 radar. According to CDR Fravor the first indication he had of the unknown contact was a visual of a disturbance on the water below the AAV. As he scanned the area he gained a visual on the object. It is important to note that when asked to describe the disturbance on the water he stated that it was localized underneath the object, did not appear as a trail or wake, and looked like frothy waves and foam almost as if the water was boiling. At this point CDR Fravor detached FASTEAGLE 02, which held at approximately 20,000 feet, and FASTEAGLE 01 descended to between 12-16,000 feet. CDR Fravor attempted a “helmet lock” that was unsuccessful. It is important to note that CDR Fravor was using the Joint Helmet Mounted Cuing System which will cue the aircraft sensors such as the radar to ‘lock on’ to what the pilot is looking at and it also has a recording capability. It may have been useful in this situation but typically because of the large amount of head movement it is not practical. CDR Fravor stated that the helmet’s recording capability was rarely used therefore he did not think to use it that day. LT.__________ communicated what they were seeing with Poison control and said that he had a running dialogue on the interflight radio with FastEagle 02. CDR Fravor stated that the object was “holding like a Harrier.” (Referring to the AV-8l3 jet aircraft, which is capable of hovering and Vertical/Short Takeoff and Landing (V/STOL) via thrust vectoring.) According to CDR Fravor, the object’s shape was like an elongated egg or a ‘Tic Tac’ and had a discernable midline horizontal axis. However, the object was uniformly white across the entire body. It was approximately 46 feet in length. LT.__________ described it as “solid white, smooth, with no edges. It was uniformly colored with no nacelles, pylons, or wings.” When asked to describe the appearance, if it glowed or reflected sunlight he said, “neither, it looked like it had a white candy-coated shell, almost like a white board.” His report differs from CDR Fravor in that he reported the object traveling level at approximately 500-1000 feet at approximately 500 knots. The object was pointed in a north/south orientation and was moving both north & south and east & west, while maintaining a consistent altitude. These displacements, according to CDR Fravor, were minor. CDR Fravor stated he then began a descent with the intention to take a close aboard pass with the object in an attempt to visually identify it. They began the decent as they rolled in from about 10,000ft and approximately 350 knots to take the object close aboard. CDR Fravor pulled nose on and then pulled trail (aft) of the object. As they were maneuvering, the object appeared, according to CDR Fravor: “to recognize us.” He assessed this from the fact the object “pointed” (realigned it’s axis) in the direction of their aircraft At this time, according to CDR Fravor, the disturbance on the water ceased. As they completed this maneuver, the object ascended quickly and pulled lift vector on and aft of them at a supersonic speed. CDR Fravor commanded the radar through the Short Range radar set and asked for a picture from Poison. Poison initially reported that the “picture was clean” (no contact) but then stated “you’re not going to believe this, its at your CAP” meaning that the AAV had flown to their training CAP, which was located in the southern end of the training area and had climbed to approximately 24,000 feet. CDR Fravor stated that the flight attempted to locate both the object and the disturbance with no success. CDR Fravor stated that nothing was seen on the surface or subsurface and that there were no indications of the previous disturbance. Following the engagement, the flight rejoined and returned to the USS Nimitz. When asked how the jets functioned and if there was any indications of a system malfunction, he stated that- “the jets were brand new, less than 100 hrs. on them. They were working perfectly.” LT.__________ when asked, said that all aircraft systems were functional. That there were no mission computer issues or avionics issues and that there was no radio or communication interference and that they had entry into the Link-16 network. When asked LT.__________ couldn’t confirm any physiological or psychological feelings that were out of the ordinary. The flight met up with LT.__________ and LT.__________ ‘s flight in the paraloft and passed what they had seen. The flight proceeded to CVIC. LT.__________ noted that the sailors in CIVC had donned tin-foil caps and wanted to know about the “UFO flight.” They reviewed the tapes and described to CIVC what they had seen and what the flight had done. He was not asked to sign any non-disclosure agreement and he is uncertain how far up the chain the reporting went past his commanding officer. LT.__________ was a member of VFA-41 and was the Weapons and Sensors Officer (WSO) flying with LT.__________. They were a part of the second F/A-18F section airborne that day from VFA-41. Their flight launched following the FASTEAGLE flight. The crews spoke with each other in the paraloft, discussed the object and that the flights were scheduled for the same working area. FASTEAGLE flight told LT.__________ ‘s flight what they saw and to try to see and record what they could. The flight walked, started and launched. They completed their departure from the USS Nimitz, climbed to altitude and separated to begin the training portion of the flight. According to LT.__________ it was a clear day. There were no clouds and there was a discernable horizon. The time was approximately 1500L. The flight checked with the E-2C and separated. Their jet proceeded south to the southern cap. They flew at 20,000 feet and were flying a max endurance profile at approximately 300 knots ground speed. All on board systems were functioning normally. The radar was in a standard search mode (RWS/ 80NM/ 4bar/ intr) and the FLIR was in L+S slave (the FLIR would point in direction of a radar L+S track). There was no radio or communication interference and they had entry into the Link-16 network, Initial awareness of an object came via the radar. According to the radar display, the initial tracks were at approximately 30-40 nm to the south of the aircraft. Lt._________was controlling the radar and FLIR and attempted multiple times to transition the radar to Single Target Track (STT) mode on the object. The radar could not take a lock, the b-sweep would raster around the hit, build an initial aspect vector (which never stabilized) and then would drop and continue normal RWS b-sweep. When asked, LT.__________ stated that there were no jamming cues (strobe, champagne bubbles, “any normal EA indications”). It “just appeared as if the radar couldn’t hack it.” The radar couldn’t receive enough information to create a single target track file. The FLIR, in L+S slave, pointed in direction of the initial track flies as the radar attempted lock. The FLIR showed an object at 0 ATA and approximately -5deg elevation (Figure 2). According to LT.__________ “the target was best guess co- altitude or a few thousand feet below,” estimating the object to be between 15-20 thousand feet. The object, according to the FLIR, appeared stationary (Figure 3). There was no discernable movement from the object with the only closure being a result of the aircraft’s movement. 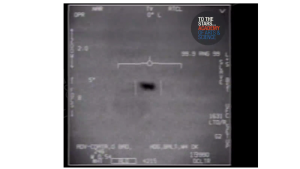 As LT.__________ watched the object it began to move out of FLIR field of view to the left. LT.__________ made no attempt to slew the FUR and subsequently lost situational awareness to the object. The Flight continued with training mission with no further contact with object. LT.__________ was clear in that he couldn’t confirm that it was the same object as described by FASTEAGLE flight. He never had visual, only seeing the object via the FLIR. He reaffirmed that all systems were functional. Following completion of the training portion, the section returned to the ship for a normal approach, landing and shutdown. The crew met in CVIC and debriefed. LT.__________ said that the CIVC section attempted to collect his tapes but he refused. They proceeded to their ready room where they debriefed with CDR Fravor and his flight. Copies of the tapes were made with a set being turned into the intelligence section. LT.__________ was not asked to sign any non-disclosure agreement and he is uncertain how far up the chain the reporting went past his commanding officer. When asked LT.__________ couldn’t confirm any physiological or psychological feelings that were out of the ordinary. He only expressed a feeling of confusion during the event. _ now a civilian working for the US Navy, who was a qualiﬁed Submarine Ofﬁcer onboard the Louisville in November 2004 during the AAV activity there were no unidentiﬁed sonar contacts in the vicinity of the aerial sightings or at anytime during the operations off the coast of California. The former commander of the USS Louisville, CAPT.______ conﬁrmed that there was no anomalous undersea activity during this period. There was a live ﬁre exercise conducted by the USS Louisville during the period of and in the vicinity of the AAV sightings; however, the weapon in use did not match the flight proﬁle or visible characteristics of the AAV. Additionally any live fire would have been coordinated throughout the CSG and all air trafﬁc would have been well aware of the launch and operation of the weapon system. Aircraft would not have been vectored for the intercept of a US Weapon in- ﬂight. Based on the lack of detection of any unidentiﬁed sonar contacts it is highly unlikely that an AAV operated below the surface of the ocean; it is possible that the AAV demonstrated the ability to be cloaked or invisible to the human eye based on pilot reporting of the water disturbance with no visible craft; Based on the assessment of Mr._____ if the AAV did operate underwater undetected it would represent a highly advanced capability given the advanced capability of our sensors. Typically most if not all reporting on any CSG mission related air activity is completed in CVIC by the intelligence personnel. At least one pilot or aircrew member of each flight or aircraft will stop by CVIC to be debriefed by intelligence. Intelligence personnel will then take the information provided by the pilot or aircrew member and complete a mission report (MISREP). During contingency or wartime operations a MISREP is filed even if the aircrew had nothing significant to report (NSTR). On 14 November following the intercept of the AAV, CDR Fravor reported to CVIC to debrief with Intelligence. He discussed the entire mission and AAV contact with LCDR_______ the Carrier Air Wing Intelligence Officer. According to LCDR______ be “wasn’t sure what to do”. He also stated that they “didn’t take it seriously” at first; however, they had absolutely no reason to question the report from a very experienced and well-respected F/A-18 squadron commanding officer. LCDR_________ added that they likely would have not given as much attention if it came from a lesser-experienced aviator. He reported it to the Commander of the Air Wing, CAPT___________ also a highly experienced aviator but he did not take it very serious. LCDR___________ completed an email based MISREP. It was submitted via email because the F/A-18s were on a training mission. The email-based report including the FLIR video was sent via a secure system to CAPT__________ at 3rd Fleet Intelligence, their higher echelon command. Finally, LCDR_________ admitted and detailed the high level of ridicule that the aircrew experienced over the next few weeks. The following details were also confirmed with CAPT_________ the CSG-11 Senior Intelligence Officer (N2). Capt.________ confirmed that the CSG leadership asked him if any additional reporting was required and he advised that since they were in a training environment an email based MISREP to 3rd Fleet N2 was the only report required. When asked what he thought the AAV was he replied that he believed it was part of a counterdrug operation based on the area of operations. The 3rd Fleet N2 at the time of the event was CAPT_______ . CAPT_______has since retired from the US Navy and could not be located; however, his deputy N2 was CAPT______CAPT__________ confirmed that the MISREP was received via email on or about 14 November 2004. Since this MISREP was completed during training and preparation for deployment it was read and acknowledged by Fleet N2 but was not forwarded to anyone up the chain of command. Additionally CAPT_________stated that it was not likely archived but deleted at some point later as there is no requirement to keep these reports and it was likely in file folder with all of the other training MISREPS sent in by the CSG during deployment preparation. The commander of the Nimitz Carrier Strike Group during the intercept was Rear Admiral D.C. Curtis now a Vice Admiral (VADM) and is commander of Naval Surface Forces and the Pacific Fleet’s Naval Surface Force. All of the AAV activity was reported to VADM Curtis by the Commanding Officer, USS Princeton and Commanding Officer, VFA-41. Based on all of the conversation with those involved and among the leadership of the various combatants within the CSG. VADM Curtis was a well respected, competent, and thorough Naval Officer. There is no question in anyone’s mind that he followed any and all regulations and guidance applicable to his command. Capt.______was the Director of Operations (N3) for CSG-11 at the time of the intercept. Capt. _______confirmed that other than the MISREP there was no other official report or statement from the CSG. He also stated that at no time did they consider the AAV a threat to the battle group. Additionally they had no advanced knowledge of live fire events, US Weapons Testing or any other experimental aircraft operating in the area. Finally, they had never seen anything like this before and never again. Admiral Peter Daly assumed command of the CSG in January 2005 after the intercept and had no knowledge or involvement in this incident.